You can cultivate 62 (or more!) 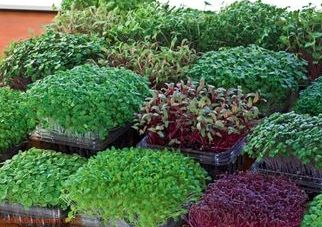 different species of microgreens. This website provides the unedited "raw" manuscript of the 1st half of the book. The 2nd half of the book is devoted to detailed information about the Tray Method, and about 55 of the 62 species, but for that you must buy the book. Sorry to disappoint you here! Here is an example of the detailed discussion of only 1 species, BASIL. To read further about the other 54, please BUY the BOOK. Difficult to germinate and difficult to grow. Sowing: Fill soil up to the container rim because stems are short, thus Basils grow low. Spread seeds especially thinly, not touching each other, because they are so mucilaginous that when first watered they congeal into a solid mass. Germination: Light enhances germination. Very mucilaginous, so once watered do not disturb the seeds. If kept in darkness, still will germinate but at a lower ratio initially, which in part accounts for a sizable later second wave. Daytime temperature above 70 degrees F must be maintained, otherwise do not waste your time waiting for Basil to germinate. In winter, an incubator is especially needed to assure adequate warmth. Harvest: Due to overcrowding, once the true leaves initially form the seedlings hardly grow any further in size, only in fiber, so best to harvest upon or before the initial emergence of the true leaves. Yields a significant second wave, so do continue to tend to the shorn container or tray past first harvest. Flavor: Both seed leaf and true leaf stages provide the same distinctive mint-like flavor for which mature Basil is so much sought. But seed leaf stage is far more tender and succulent. Notes: Basil will rank as your favorite microgreen though its small yields and demanding cultivation might dampen your enthusiasm. If harvested but not immediately consumed, it must be stored at temperatures above 50 degrees F (10 C), as refrigeration blackens the leaves and turns them to mush, so is seldom seen in the marketplace. 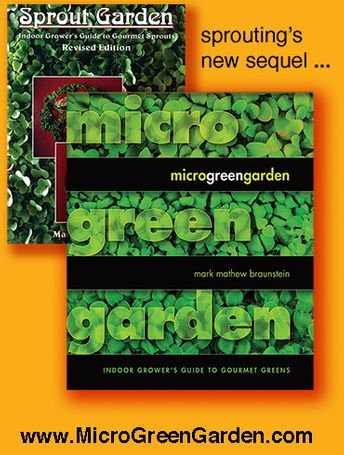 Serve yours to friends who have never grown their own microgreens, and they will want to grow their own just to assure themselves a bottomless salad bowl of Basil microgreens. And that way you will have friends who can invite you to dinner to serve you theirs. Flavor: Best before true leaves begin to emerge, but even at true leaf stage its flavor still is superlative. This is the cultivar that serves as the high standard by which all other Basils are measured. Only Thai Basil surpasses its delicious flavor. Notes: Compared to all other Basils, Sweet Basil (also called Genovese Basil) seeds are far less expensive, so consider purchasing seeds by the pound or half-kilo. Color: Mostly purple leaves, but some retain green. Sowing: Same 2-4 days germiination as Sweet Basil, so is suitable for sowing together to accentuate the green of Sweet Basil even while they are growing. Try a mixture of 1 part Opal Basil seeds to 10 parts Sweet Basil seeds. Germination: 2-4 days and mucilaginous and enhanced with light, same as for Sweet Basil. Flavor: Bland compared to Sweet Basil, so grow this for its color and to sprinkle into Sweet Basil. Notes: Unlike other specialty Basils, seeds are relatively inexpensive. A few Purple Basil seeds sprinkled onto a bed of Sweet Basil seeds creates a very appealing dash of contrasting color, and is perhaps the best use for Purple Basil. Color: Tiny, delicate leaves are yellow green for first 7 or 8 days, then turn all green. Stems turn rose purple if exposed to direct light, but if crowded the stems of interior plants remain buff green. Germination: 4 or more days and mucilaginous and enhanced with light. Harvest: Slower growth and smaller size than Sweet Basil, so yields a smaller bounty for your same efforts. Even its second wave is smaller, which simply means that most of the seeds germinated during its first wave. Flavor: Sweet Basil’s only rival. Its unique Mint flavor warrants its extra growing time and lower yield. Requires daily temperatures above 75 degrees F. to bring the Mint flavor to full force. Notes: The most expensive of the five cultivars listed here. Takes longer to germinate and longer to grow than other Basils. But worth it! Germination: 4-5 days, slower than other Basils. Flavor: It tastes more like lemon, which is a good thing. But it tastes less like Basil, which is a bad thing. Notes: Of the five cultivars listed here, this is the most beautiful of Basils. Its uniform growth causes the leaves to form a tightly woven shield-like canopy. Color: Green leaves with purple veins and purple stems. Flavor: Its cinnamon aroma is stronger at seed leaf stage, but even then only if you poke your nose into the leaves. When eaten, it tastes only slightly like cinnamon, so seeds may not be worth their extra expense. The above is about only 1 species, Basil. To read further about the other 54, please BUY the BOOK.